For the last four years, Jaap Bongers, Harker’s upper school art department instructor and chair, has used the summer break as a unique opportunity to personally donate items to needy children in the Republic of Zambia, a landlocked country in Southern Africa. “I have been going there every summer and one time I even went during the Christmas break,” said Bongers, explaining that, in preparation for the annual sojourn, he uses the school year to collect toys, children’s clothes and children’s books (many of which have been donated by Harker students) for the Zambian children. Come summer, he fills a big plastic storage box with the donated items which he takes with him to Zambia. There, he donates the toys, books and clothes to the neediest children he encounters. After handing out and emptying the storage box of donated toys, Bongers then re-fills it with ancient traditional artifacts he discovers and buys on his travels. “I note down their use, meaning and age. I have found objects and heard about customs that were not yet known. Once I return to Harker I use this information, the items and the pictures for my Study of Visual Art class,” he said, noting that his house is filling up with an impressive collection of ancient traditional African art. A particularly interesting find this year was an old food box from the Lozi tribe, which Zambian women use to present food to their husbands. 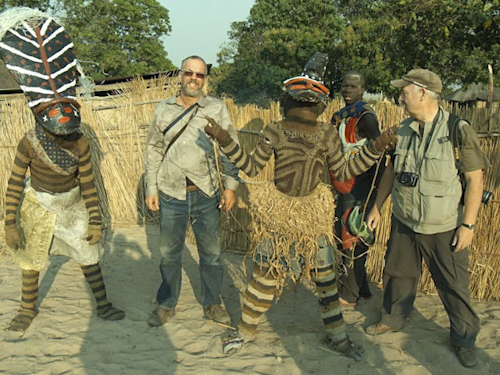 In addition to discovering such treasures, Bongers also enjoyed such cultural experiences as buying an ancient artifact from a witch doctor, watching a traditional masked dance at night in Kaoma, and meeting Makishi dancers near Mongu in the Western Province. The remote villages that Bongers visits are reminiscent of the hunter-gatherers and migrating tribes who inhabited the country for thousands of years before Zambia was claimed and occupied by the British as protectorate of Northern Rhodesia towards the end of the 19th century. In 1964, the protectorate gained independence with the new name of Zambia, derived from the Zambezi River which flows through the country. Zambia’s economy has been traditionally dominated by the copper mining industry, however, during the 1970s, the country began sliding into a poverty from which it has not yet recovered – which is why the donated goods Bongers collects during the school year and hands out in the summer are so appreciated.